Team Neutrino is super excited to be back at the world championships in Detroit! After a long 12-hour bus ride through the night, the team entered the Cobo Center weary, but enthusiastic for the amazing and huge experience ahead of them. Team Neutrino will be competing in the “Archimedes” division. You can find the match schedule here. Wednesday of competition was spent repairing the robot and testing it on the practice field and during practice matches. Thursday and Friday of competition will be spent competing in qualification matches. Saturday will begin the division playoffs, where the winners of each division will proceed to the Einstein Finals. With nearly 400 FRC teams from across the globe, as well as many more FTC, FLL, and FLL Jr. teams there’s a whole lot to do and watch at Detroit. Congratulations to all teams (both those at champs and not) on a great season, and good luck to teams competing in Detroit! One more regional to go! Team Neutrino will be heading to La Crosse, Wisconsin for their week 6 regional with 53 other teams. 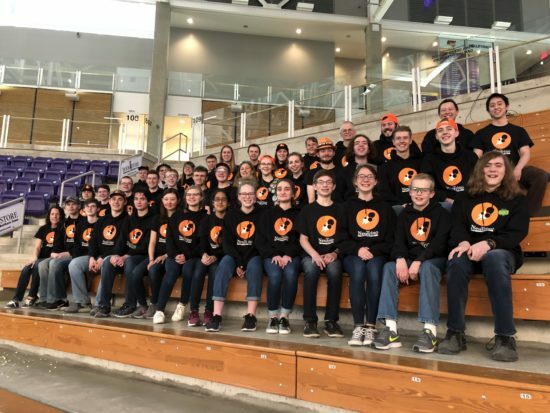 The team worked out some kinks in the robot at the Iowa Regional and the weeks leading up to Seven Rivers and are all excited to meet some new competition. This is the team’s last chance to qualify for the World Championships in Detroit! Wish any Neutrinos you see good luck! You can check out the teams and match schedule here (match schedule posted Thursday night). The link to the live stream will be posted here Thursday. First competition completed! Team Neutrino had an excellent competition, with a 8-2 qualification match record, the team seeded 3rd thanks to its consistent and quick cargo and third level climber and the aid of its alliance members. The team also helped to hold the Chairman’s exchange where teams could present their Chairman’s presentations and receive feedback from other teams. In alliance selection, the team was the 2nd seed alliance captains and choose teams 1732 and 904, passing through quarterfinals against the 7th seed alliance and narrowly losing the second match in the semifinals to the 3rd seeded alliance. At the closing ceremonies, Team Neutrino received the Quality award, which “celebrates machine robustness in concept and fabrication. ” Nitzan Friedberg, the team’s Design Manager, also was nominated to be a Dean’s List Finalist. Congratulations to Nitzan and the team wishes him good luck in Detroit! Team Neutrino will be back at it again April 3rd-6th at 7 Rivers! It’s week 4 and it’s time for Team Neutrino’s first competition of 2019! Team Neutrino will be competing at the Iowa Regional from the 20th-23rd with 47 other teams in Cedar Falls, Iowa. The team is super excited to show off the robot, as well as a couple of surprises they’ve been working on between Bag Day up to now. Check out how the team is doing by either coming to watch us compete at the McLeod Center or watching the live stream (here) and stats (here)!